Today was a dreary cold day, so I decided to drag out my sewing machine and add the final 4" border around the edges of this quilt. 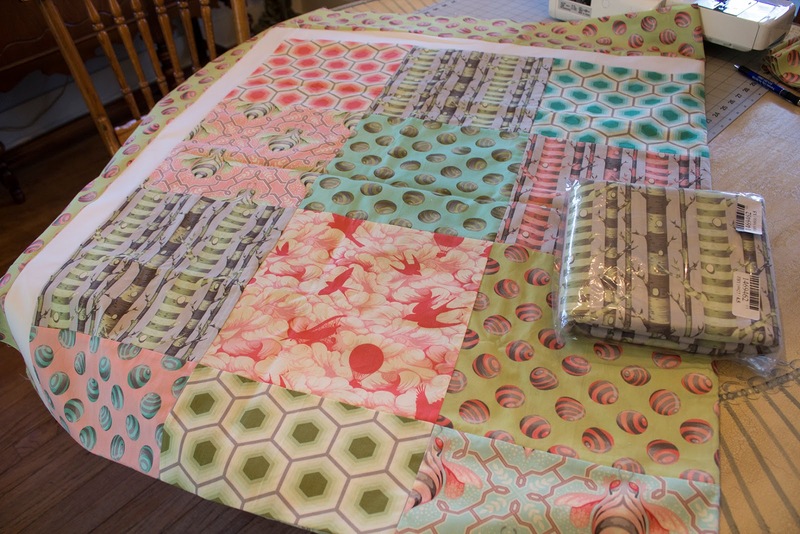 When I first bought this layer cake of 10" squares I couldn't figure out what kind of quilt I wanted to make. 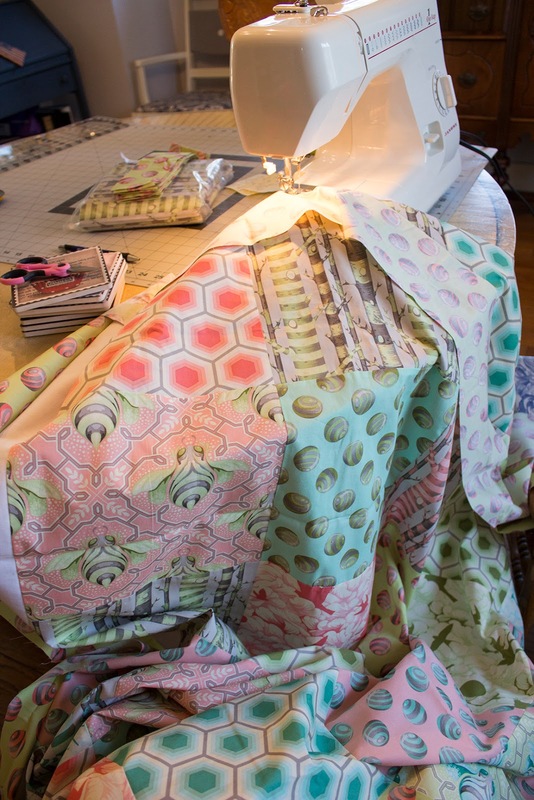 The designs on this fabric, Bumble by Free Spirit, were a bit large and cutting it up into small pieces for a quilt just didn't set right with me. I loved the bumble bees in various shades of aqua, light green, and coral. But, my favorite from this fabric line are the tall striped trees. I really wasn't comfortable with cutting it up. As you can see, I chickened out and simply sewed the 10" squares together. Now I have to decide how I want to quilt it. I could just go with yarn ties in the corners of each square, free motion quilt it on my machine (which I've never tried by the way), or take it to my local quilt shop to have it machine quilted. It measures 71" x 80" and will make a great throw for the bottom of the bed or over a chair. I will be backing it with the green and gray tree fabric that's in the plastic bag. This whimsical fabric on the reverse side may be my favorite part of this quilt when it's finished! What are your ideas about how I should quilt it? Yarn ties might mess up the symmetry of the trees on the the back. What do you think? If I could afford it, I'd take it to be professionally quilted. I have a finished quilt top upstairs that needs final finishing and I hope to have it done. I don't think I could handle free form on my machine. Of course you could run a stitch on either side of your seams and that would look good, too, and highlight the squares. Let us know what you decide. Lots of beautiful fabrics in your pretty quilt! 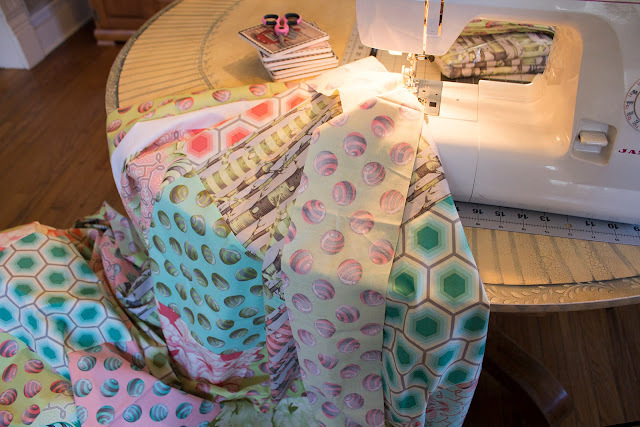 Unless you are a big risk taker, if you have never done free motion quilting, I would try it on a small project first. It takes practice to develop your muscle memory to do free motion. I am still learning and have been practicing for a few months. Still not ready to do a quilt of pricey fabric. Place mats, pillow covers, etc are good first projects. I love the fabric you chose for this one. Thanks Vicki. A couple others have talked me out of it as well. I think I'll just quilt it on my machine diagonally from corner to corner. I'll practice the free motion on a small quilt I'm making for my dog. She won't care what it looks like. Ha! Your quilt is very nice and I think doing a simple quilting on your machine might be the answer.